TL;DR: This is a series on how to build a full-stack TypeScript web application using Angular and Nest.js. In the first part, you learned how to build a simple API with Nest.js. In part two, here, you are going to learn how to use Angular to develop the frontend of the application that communicates with Nest.js. You can find the final code developed throughout this article in this GitHub repository. "Learn how to develop full-stack @typescriptlang applications with @nestframework and @angular." 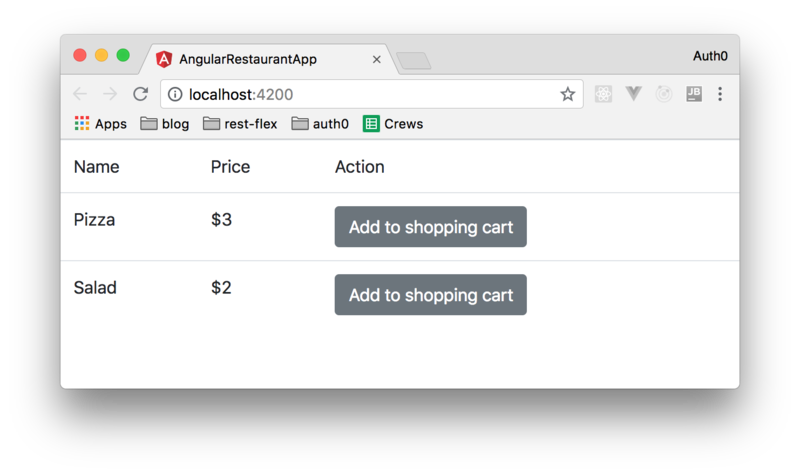 In part 1 of this series, you learned why you should use Angular together with Nest.js to create a full-stack web application using TypeScript. Then, you created a Nest.js backend app that manages the menu of a restaurant. This API had three endpoints. One that accepts unauthenticated requests (GET /items), another one that accepts requests from authenticated users (POST /shop-cart), and the third one that accepts requests only from users authenticated as administrators (POST /items). Throughout this article, you are mainly going to create code located under the src/app directory. In the structure created, you will see some files related to automated tests (like test.ts and these files that have spec in their names). Although implementing automated tests is extremely important, in this article, you are going to ignore them so you can achieve your goal faster. Note: If you want to learn about testing Angular applications, please, check this series that we prepared for you. Note: If you have questions about what role each file and directory plays, you can find answers in Angular's documentation page. To make the article easier to grasp, first, you are going to develop an Angular app that doesn't interact with your backend API. After that, you will integrate it with both your Nest.js API and with Auth0 (so your users can authenticate). items.component.css: This is the file where you may add some local style for your new Angular component. items.component.html: This is the file where you are going to add the HTML code to structure your information. items.component.ts: This is the file where you are going to place the code that controls the behavior of this component. Basically, this version of the component is hard coding some items so you can see the view working. Also, this version is adding a fake addToCart method that simply confirms the action by triggering a window.alert with the Added message. As you can see, the code above contains an HTML table with a row (tr) that uses the *ngFor Angular directive. 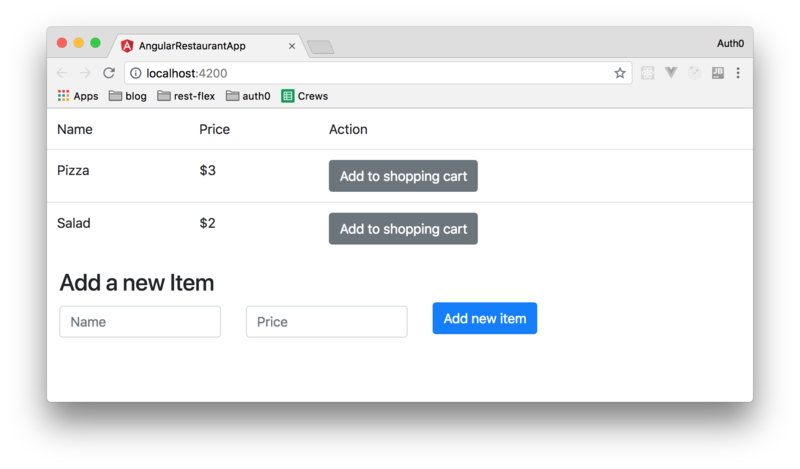 This directive makes Angular iterate over every item in the items array to build a table that exposes items' price, name, and a button to invoke the addToCart method. and itemSubmitted a boolean used for validation. Note: you could create a new component to handle the form (e.g. ItemsForm) but, to keep things shorter, everything in this tutorial related to items will be created under the same component. 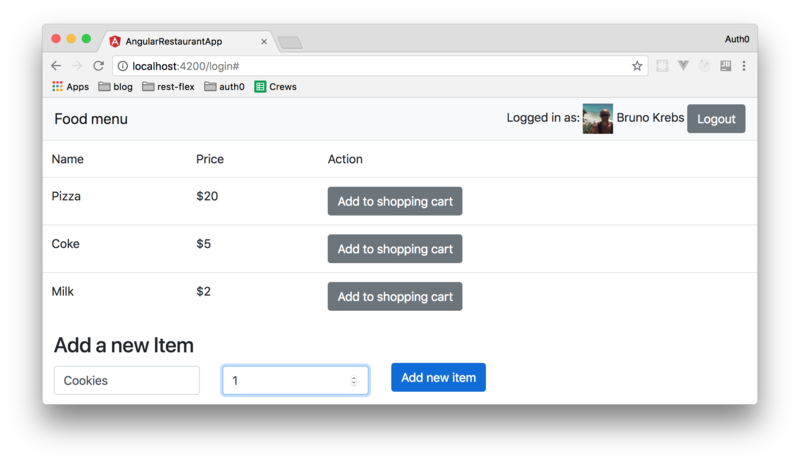 With these changes in place, you have finished developing the mock functionality that allows users to manage items on the menu. In the next sections, you will integrate your application with Auth0 and implement the missing parts that make your app communicate with the backend API. 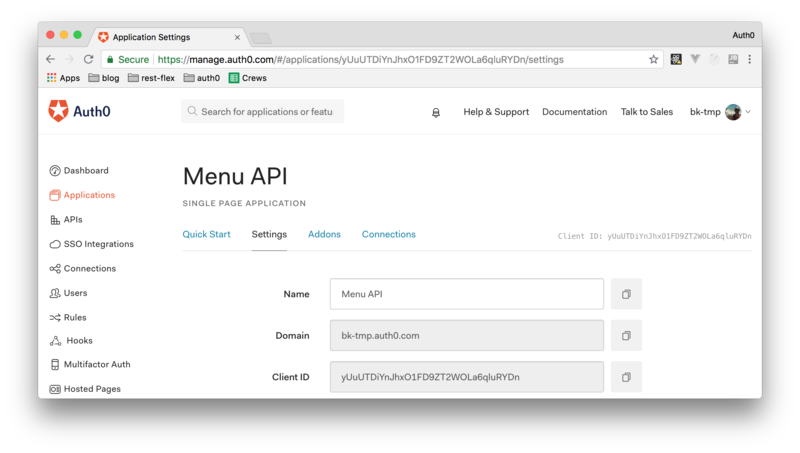 In the first part of this series, you have secured your Nest.js backend API with Auth0 to guarantee that only certain users can manage the list of items. 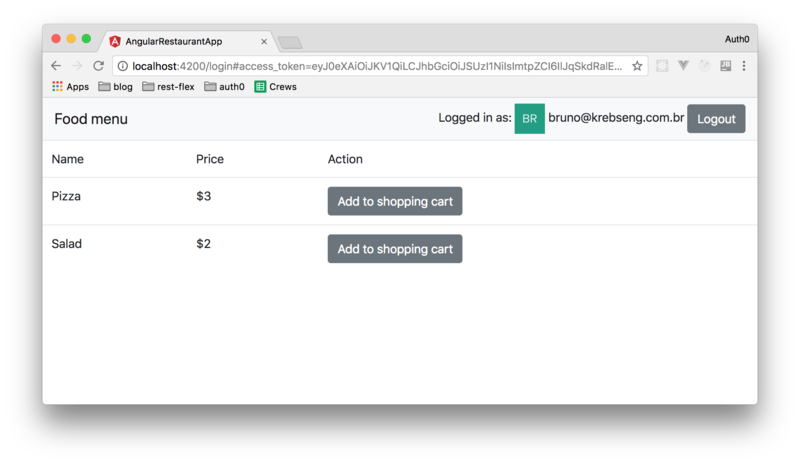 As such, you will also need to integrate your Angular application with Auth0 so your users can authenticate to perform these actions. After installing these libraries, you will need to create an Angular service to interact with the Auth0 login page. Note: If you have ever created a similar service using browser's localStorage before, here you are going to use a better (more secure) strategy that requires new tokens to Auth0 every time the page reloads. This strategy avoids using localStorage and keeps everything in memory, so you will make your application safer. The code snippets above contains two placeholders that you will need to replace: [CLIENT_ID] and [DOMAIN]. These placeholders refer to the Auth0 Application that you have created in the previous article. So, open your Auth0 Dashboard, head to the Applications section, click on the Single Page Application you created, and copy the Client ID and Domain properties from it to replace these placeholders. While on your Auth0 Application, find the Allowed Web Origins field and set http://localhost:4200 as its value. You will need this because your Angular application will issue cross-origin requests to check if users are authenticated or not. The code above is basically getting an instance of AuthService injected into the authService private field of this component. Then, you make use of this instance to redefine only the methods that you want to share with your view (avoiding to share unnecessary stuff). The elements above are basically verifying if the user is logged through the *ngIF directive. If the user is authenticated it will show the profile, otherwise, it will show a login button. People who are not identified users should not be able to click the button to add an item to their shop cart and people who are not admin users should not be able to include new items. Now, you can test your application with different accounts to see these changes in action. So far, your Angular application didn't actually communicate with the Nest.js backend API you developed in the first article. So, in this section, you are going to integrate the frontend app with the Nest.js backend API you in the first article. In order to interact with the backend service, you will need to deal with CORS (Cross Request Origin Sharing). This is so because the calls made by Angular to your backend will be blocked by browsers because of the Same-origin policy. That is, as a security measure, browsers block requests made to different domains unless these domains explicitly say that they do allow these requests. As you can see, every method (other than _authHeader(), which adds the access token to requests) is just a wrapper to an HTTP request. And head to your app (localhost:4200) to test it. From there, you can add new items that this time will be synced with your backend application. 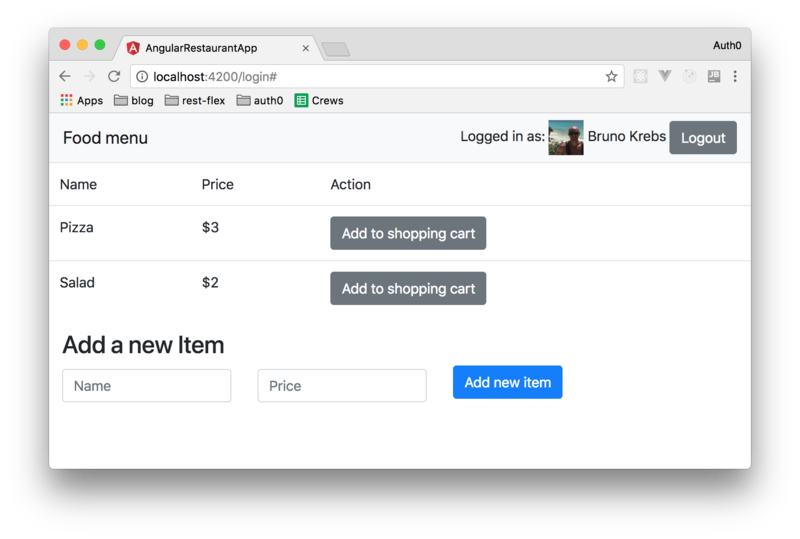 To check this, you can restart your Angular app and you will see that the new items you create will still be available (prior to these changes, your items were actually held in memory by Angular). Just don't forget that to update the list of items available in the menu, you have to authenticate yourself with the email address that you have used in the Auth0 rules in part 1 of this series. "I just built a full-stack @typescriptlang application with @nestframework and @angular!" In this series, you learned how to create a full-stack application that uses TypeScript on both sides (in the backend and in the frontend). 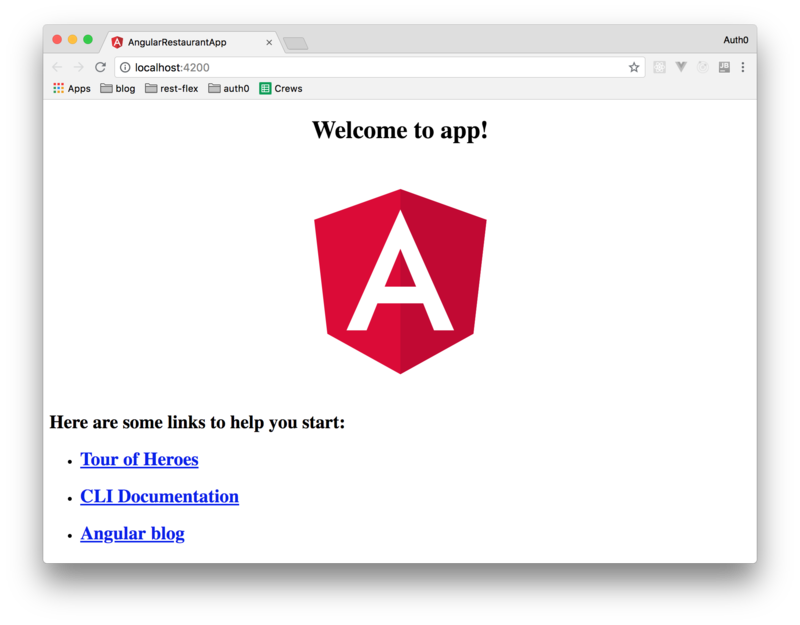 In the first part of the series, you created a Nest.js backend API and secured it with Auth0 then, in this article, you created a nice Angular app that is also secured with Auth0. Is this application production ready? I wouldn't say so. For starters, you will need to create some automated tests to guarantee that future changes don't break the current functionality. Also, you will need to integrate your backend API with some reliable database (such as MongoDB or PostgreSQL). However, with this series, you acquire sufficient knowledge to start creating modern applications with state-of-the-art technologies.